Now how do you do something like that? Even if you connect to the Internet via a cable modem, whereby your Internet address comes from a floating pool and changes often, you can still associate your Mac with a fixed domain name that people can use to look you up, eg., myMac.dyndns.com, or Sivasothi.com, no less. There are many advantages to doing this. For a start, you can bring your system wherever you go and people can look you up in a consistent way. Say, somebody has learnt to drop stuff into your shared folder at myMac.dyndns.com. You can unplug your system, switch locations (say, to another home) and your friend will still be able to find you at your new location, just by following jchou.dyndns.com. It's easy to set up. Once you succeed in doing this, you may start to see further possiblities. One . You need a friendly, human-readable host name to give to your OS X-based Mac. You can get a free host name by registering with DynDNS.com. 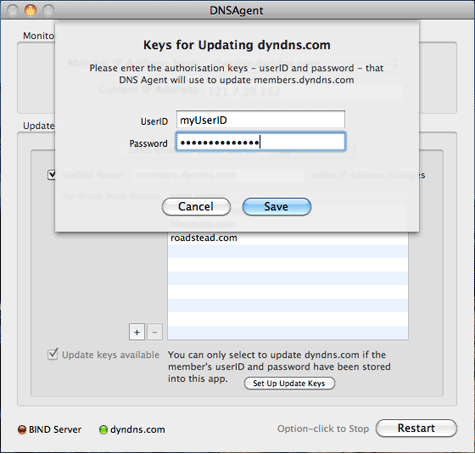 Registering means getting a User-ID and password and, of course, a host name that's been registered with DynDNS.com. Two. DynDNS.com's Domain Name Server allows itself to be automatically updated each time your machine gets a new IP address, hence its name. So how does DynDNS.com get updated. For that you need a special piece of software running on your Mac. Three. 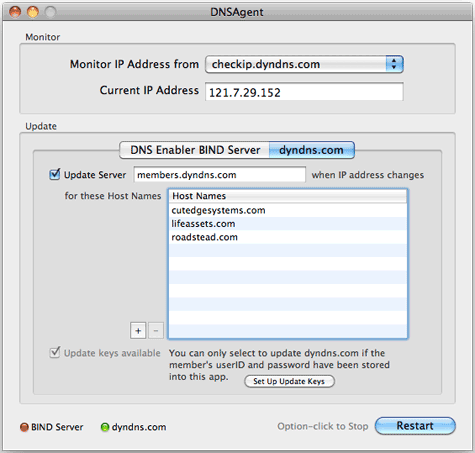 You need a program running on your Mac that knows how to tell that your IP address has changed and pass that message along to DynDNS.com's server. This program is DNS Agent. You download this, copy it to the Applications folder, launch it, and provide it with your DynDNS.com member UserID and password so that it can login on your behalf. You also tell DNS Agent the domain name it is responsible for updating. Once you've done that, however often your IP address changes and as soon as it does, DNS Agent will update DynDNS's domain name server with your latest IP address and keep your domain name-to-IP address mapping up to sync. That's how people who come looking for you via your domain name will always be able to find you. Turn on OS X's built-in Web Server using the Sharing Pane in Systems Preferences. (Check to make sure the web server is running by typing "localhost" into Safari runing on the server itself. If the web server is running, you will see the Apache default web page). Then do Steps 1 to 3, above. Get a friend to hit your web page using the domain name you obtained from DynDNS.com. If you need a custom domain name, like myCompany.com, you can buy one from any registrar, say Dotster.com. Then, register this with DynDNS.com, for a small fee. Finally, you tell Dotster.com that your domain name is managed by DynDNS.com. Well, you can now run a dozen things on that Mac. A weblog, a discussion group, your own mail server, PHP, Perl, Java, WebDAV. It's endless. The applications that are built-in to every plain-vanilla Mac are respectable first-class web applications. They're steady, powerful, and they're now ours to use, too. We ought to use them well because there are little things on the Mac that makes doing IT fun again.